Didn’t have much to mention last week. I’ve been digging into Redshift renderer. I’m still learning a lot about it, but I will say it’s very intuitive and fast. So I’ve got some random renders to share as I delve deeper into it. So to add a little life to my water element, I want it to animate and have waves cascading. What I can do is create a new shader, MIA_X like I did for the other elements but fine tune it’s parameters for water. Last time we looked at this piece I had switched to HDR Lighting on it. The way I had arranged the vegetation on the mountain buttes didn’t sit well with me. It looked too sparse and purposefully placed. Something I wanted to try on this as well as using Maya dynamics, specifically emitting particles on my geometry for the plant life. This would give greater coverage of grass, shrubs, etc. I wanted was to still have control on where the vegetation grew. Up to this point I’ve been using the Physical Sky and Sun for rendering out my scene. But it has it’s limitations. One being I can’t easily tweak the sky itself without affecting the sun, or another way to say I can’t easily adjust the sky fill in the shadows without affecting my key light. By switching to HDR Lighting, this will allow me greater control of my scene’s lighting. First, we’ll need to get rid of our Physical sun node. Select your camera, then go Window—Hypergraph Connections. Select the Physical Sun and Sky node and delete it. Now you’ll still have the sunDirection light from the Physical Sun node in Outliner. Since we’ve spent time positioning it, we’ll want to copy it’s position to the new Direction Light we’ll now create. Select the SunDirection Light in the Outliner, set a key on it’s values, and then right click to “copy selected” in the Channel Box those positional values. Create a new Direction Light, and in the Channel Box, “paste selected” into the channels. The new Directional Light is in the same position as our Physical Sun light. Rename the new light “HDR_Sun”. Turn off visibility on our old Physical sun or delete it. This week was mostly trying to add more elements using the scene assembly methodology, which worked really well. Each of the mesa mountains now has grass/plant populations on them. I am still tweaking them but the results I’m seeing are very positive. What’s great is the level of polys in my scene are extremely high, but since I’m using instanced geometry with the scene assembly I’m getting very good results. 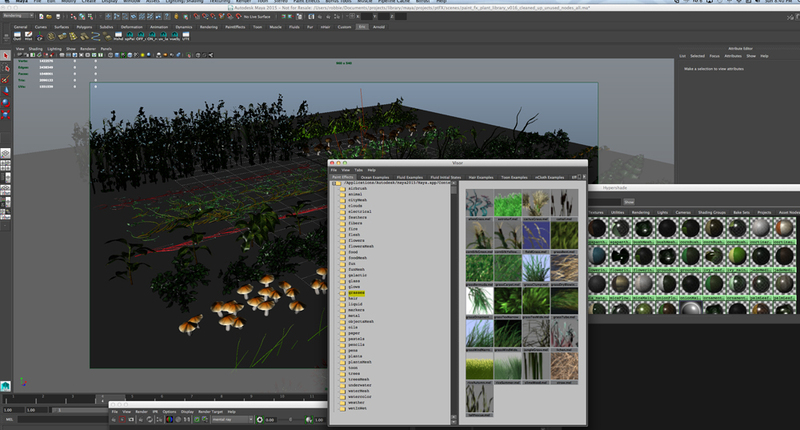 I’m able to make quick changes to each section then open the master scene and render all elements together. What I did work with was something called Mental Ray Proxies for the first time. Instead of eco-painting with my high res geo, I’ve created a low res/bounding box type of geo that I will paint with and see in my GUI but when I go to render it will be replaced the high resolution object and shader. This allows me to interactively paint quicker instances and seems to have the individual scene files load quicker as well. It’s pretty easy to use. What I do first is make a simple bounding box shape of my tree. 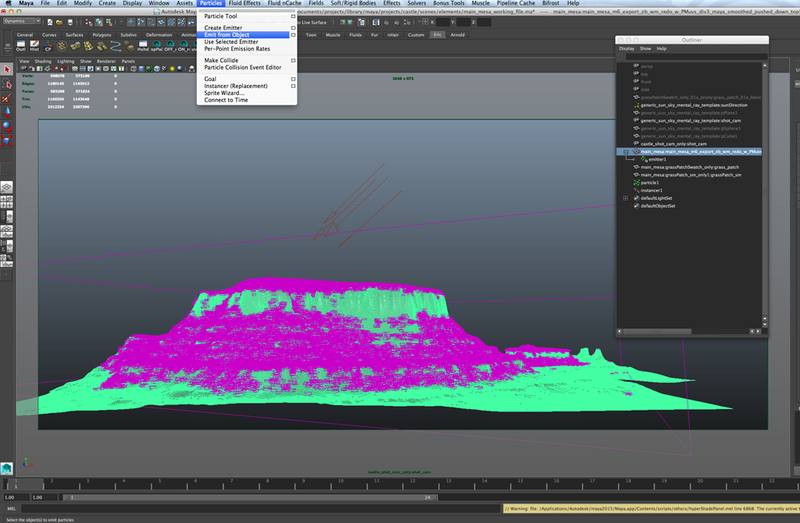 Select the high res tree, and do a “File– Export Selection”. Here you will select Mental Ray. In the drop down select “Render Proxy (Assembly)”. I try to name it same as my original obj but as proxy. 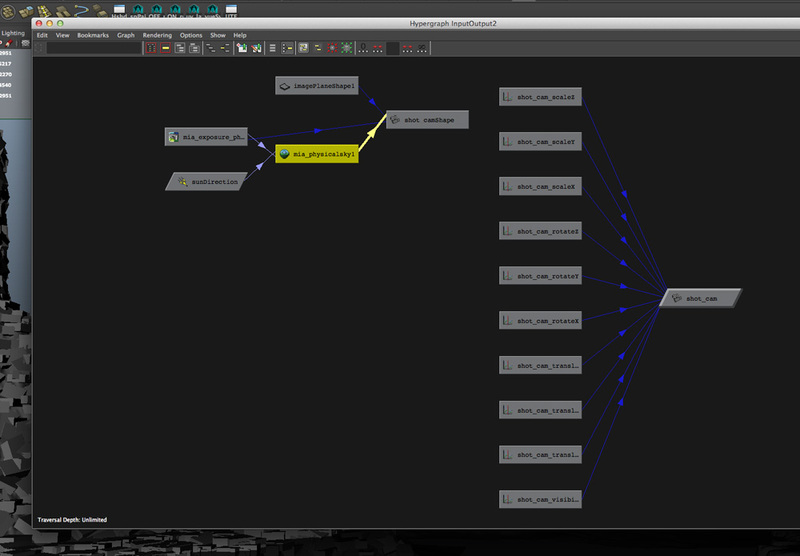 Watching various tutorials, I’ve been trying to incorporate an E-on Vue type workflow in Maya. 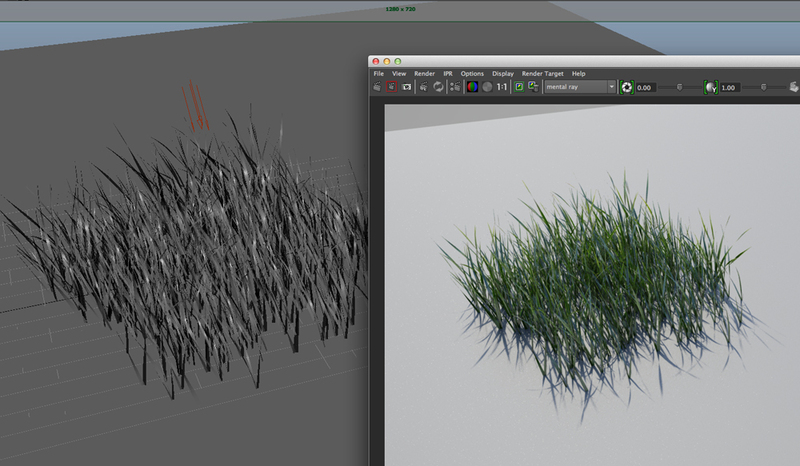 I’ve begun using paint FX and Speed Tree to create various grass, plant and tree assets so I can then “eco-paint” on geometry in Maya with Mental Ray shaders and then render in Mental Ray (I will be trying V-ray shaders on my next project). In addition since my scene file is getting much larger in terms of assets and file size I also began to use Maya’s Scene Assembly feature. Scene Assembly lets you create, edit, and view large or complex scenes without the typical overhead memory that can slow your workflow down. Building a scene with Scene Assembly improves viewport interactivity and accelerates scene loading time, preventing some common issues when working on large data sets. I won’t go thru every minute detail. Basically, you select paint FX thru Visor. Select the Paint FX you want to use (I used plants and grass). You paint strokes for each plant you want to create. Select the stroke and convert it to polygon geometry. 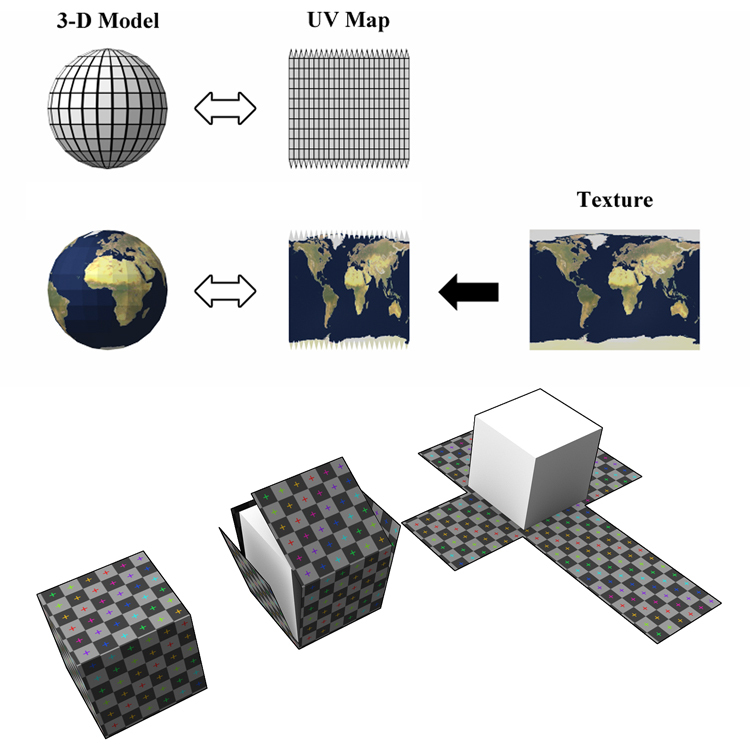 In Hypergraph create an MIA mental ray shader and assign it to geometry. Build up your shader for the components you want for each plant (color, spec, bump, translucency, etc). Save out different versions of each plant asset to have variety of models. You’ll want to center your plant at origin. Freeze transformations and make sure your pivot point is at the base of your plant. I went through and made several various plant species to build up a mini library. So last time we saw my castle piece, I had finished modeling it. For the look of the castle I wanted a combination of a Middle Eastern and Florence Renaissance inspired designs. So, now I need to flesh out my castle itself. I need to figure out it’s structure and layout. My original Concept looks like this. I need to figure out it’s form. I usually compile a large folder of reference images. I’ll scour the web and my reference library (physical books and what I’ve got on my computer). I’m looking for any and all inspiration, whether real historical places or other concepts from movies and games. Then I will compile a reference sheet that have various elements I may want to incorporate.